Bundesgartenschau — BUGA for short — is Germany’s biennial federal horticultural show. BUGA combines traditional gardening culture with modern means of marketing. Central to the current strategy is a garden gnome — one specific garden gnome, that is. 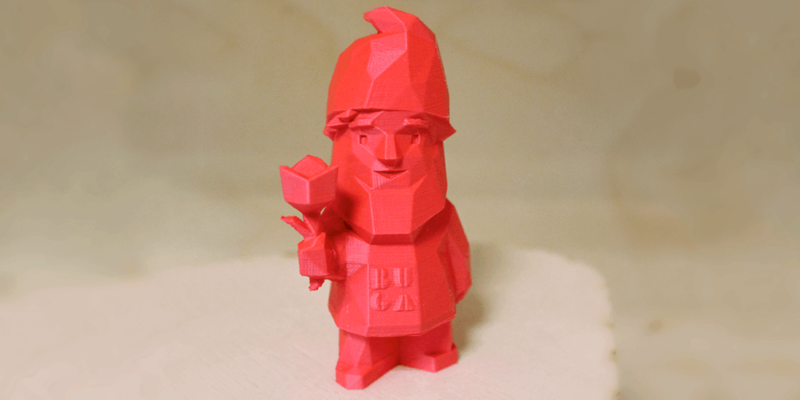 BUGA-Zwerg Karl is a 3D-printable garden gnome and the mascot of BUGA 2019. Meet Karl, the BUGA garden gnome. This colourful little garden gnome is the BUGA mascot. He represents the horticultural show’s aim to put modern architecture in a horticultural context. The pink and cubic-looking garden gnome ties various marketing channels together, from print and online ads to a mobile gaming app to a 3D-printable version of the gnome. He even has his own hashtag, #bugazwerg (the German word “Zwerg” means gnome). 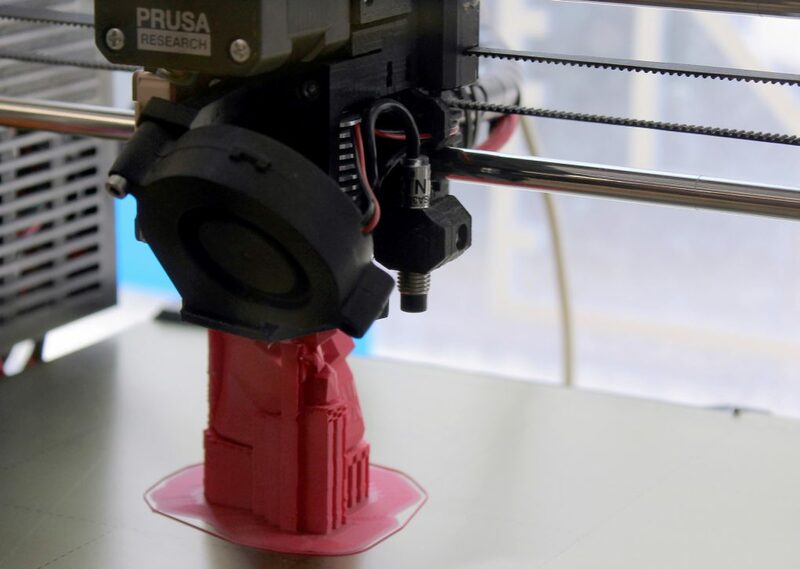 Of course, the Walls.io team had to go and 3D-print their own Buga-Zwerg. We wanted to find out more about Germany’s biggest horticulture show and its mascot Karl. 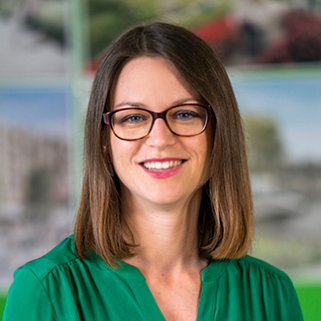 So went straight to the source and asked BUGA’s digital marketing expert Tabea Salzer a few questions. Could you tell us a bit about the #bugazwerg campaign and introduce us to Karl? Gnome Karl is the mascot of Bundesgartenschau Heilbronn 2019. He looks less traditional than usual garden gnomes. Instead, he is modern, edgy and with an eye-catching colour. Karl is definitely not your standard, generic garden gnome. „BUGA-Zwerg” Karl symbolizes the link between tradition and the future. Garden gnomes are very traditional in Germany. But the Bundesgartenschau in Heilbronn is also the first horticulture show to touch on topics like architecture, digitalization and sustainability in housing. BUGA-Zwerg Karl can be seen in Heilbronn and in the surrounding towns, standing in the public centre of the town, announcing to everybody that the Bundesgartenschau Heilbronn 2019 will start on April 17, 2019. Karl is also presented as a piece of art and as a 3D-printed object. We share the open source data for 3D printing on our website so everyone can print their own Karl at home. Gnome Karl in Bad Wimpfen, a town near the BUGA location Heilbronn. With our campaign #bugazwerg, we invite people to share pictures with the BUGA gnome on social media using the #bugazwerg hashtag. The pictures will be displayed on our Walls.io social wall, which is embedded on our website. People love Karl a lot, so they’re already taking pictures with him on vacation and all around the world. Travel addicts can get inspired by Karl who has travelled the world in 2018 and will probably see many more places in 2019. Is this your first hashtag campaign and what do you hope it will achieve? Before, we collected content with the hashtag #buga2019 and we did gain a few interactions. But that was nothing compared to our new campaign #bugazwerg. People love Karl, and that’s why they like to post pictures with him. We’re hoping to get even more pictures and interactions to spread the word about Bundesgartenschau Heilbronn 2019. Right now, we’re planning a competition — picking the best picture with Karl on our social wall — to push the interaction on our social wall to a new level. You’ve built a whole campaign around the little garden gnome, including a social media campaign, 3D printing and a mobile game. How do you tie it all together? Karl has a unique look and given he appears on different channels (in town, on websites, on social media), everybody recognizes him as the ambassador of Bundesgartenschau Heilbronn 2019. All information about BUGA-Zwerg Karl and the hashtag campaign is channelled on our landing page. In the end, it will be all tied together at the Bundesgartenschau Heilbronn 2019, from April 17 to October 6. The BUGA-Zwerg section on the BUGA website explains how to use the hashtag and has the social wall embedded as well. On location, visitors will be able to see Karl in different forms, among them one Karl made out of flowers. They can also play a Karl game (impact.karl), buy Karl at the BUGA shop and contribute to the social wall with their pictures. Wohoooooooooo…jetzt gibt’s BUGA-Zwerg Karl auch in einer App 🙂 Bei dieser Augmented Reality-App müsst ihr Karl #bugazwerg über einen virtuell erscheinenden Steg leiten und dabei so viele Belohnungen wie möglich einsammeln. Zur kostenlosen iOS Version im AppStore: https://itunes.apple.com/de/app/impact-karl/id1445708677?mt=8 Zur kostenlosen Android-Version im Google Play Store: https://play.google.com/store/apps/details?id=com.impact.karl.rallye Pünktlich zum Start der BUGA am 17. April 2019 erscheint die Vollversion der App mit weiteren Spielen, hilfreichen Erklärungen und einer Karte zur Navigation übers Gelände. Ein riesiges Dankeschön an die App-Entwickler und Designer: Dem Team von Prof. Dr. Gerrit Meixner vom UniTyLab der Hochschule Heilbronn, dem Team von iPOL GmbH und TD Die Agentur. Impact.Karl is BUGA 2019’s endless runner game in augmented reality. It was developed by students of the Heilbronn University of Applied Sciences and is available on Android and iOS. How and where are you promoting the hashtag and campaign? 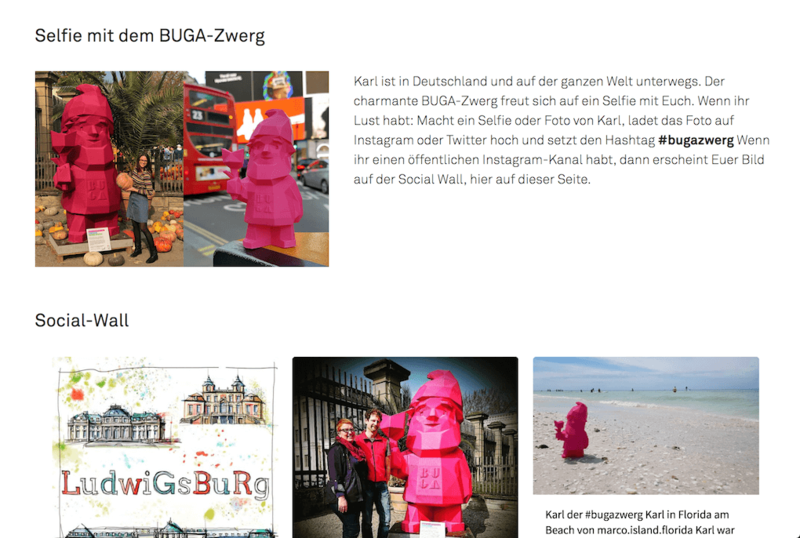 We are promoting BUGA gnome Karl and the campaign on all available channels: social media (Facebook, Instagram), website, tourist fairs, out-of-home advertising and through merchandising. You can even take a bite out of Karl because there will be one made out of chocolate. Where are you showing the social wall? One of the main takeaways from #bugazwerg is that a hashtag campaign has to entertain. The new campaign, focused on Karl, is more successful than the old hashtag campaign because it’s tied to something tangible. People like Karl. It’s a cute idea. It’s engaging as people can not just take pics with Karl but even 3D-print their own gnome. This motivates people to take part and post using the hashtag. It also shows that you don’t necessarily need a material incentive if the use of the hashtag provides entertainment in and of itself. Karl has been used to create a comprehensive multi-channel campaign. Print and online ads, a hashtag campaign, larger-than-life statues, a mobile game, merchandising. 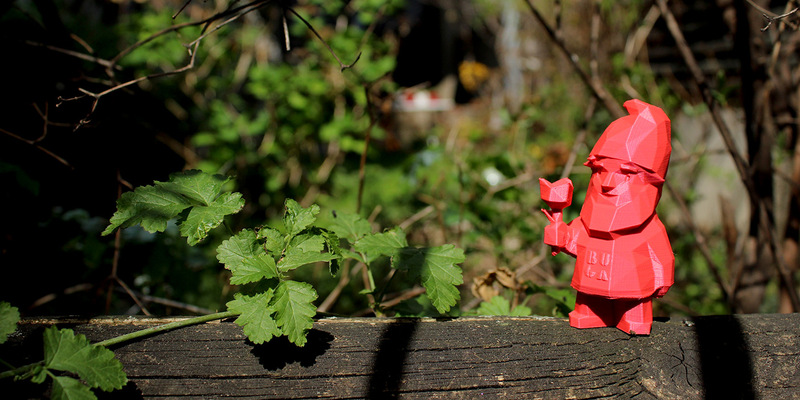 And then, people can even create their own garden gnome with a 3D printer. The oversized Karl statues, placed in towns and prominent locations in the area around Heilbronn, are excellent advertising tools because they are such eyecatchers. After all, it’s hard to overlook a 2.5-metre tall neon pink garden gnome. Marketing works best when all the parts fit together. BUGA 2019 has definitely pulled that off. Furthermore, the campaign kicked off long before the actual start of the horticultural show. The first pictures of the pink garden gnome showed up on social media almost a year before the BUGA 2019 was even set to start. It clearly pays off to plan ahead!